I have had the great fortune to have worked directly with some amazing strength and speed coaches both at the collegiate and professional level. However, the 3, who have had the most influence on me from both a style and substance perspective are Jay Butler, former college teammate and workout partner. Jeff Connors, the toughest strength coach I ever worked under, and Marty Stern, the legendary track coach at Villanova who helped me reach my dream of playing in the NFL. I have attached their biographies below. Besides being great mentors to me, most importantly, they were also people of character, who inspired athletes to do their best and taught them the value of hard work and personal accountability. Jay was recently named the head strength coach at the Tampa Bay Buccaneers. Prior to this, at Rutgers, Jay's vast knowledge in the areas of strength and conditioning helped the Scarlet Knights make remarkable strides in the weight room and on the field. For his steady commitment, Butler was recognized in the March 2007 issue of American Football Monthly as Samson's Division I-A Strength and Conditioning Coach of the Year. Butler’s drive to push players in the weight room has been embraced and its benefits have paid off for several Scarlet Knights who have made the seamless transition into the National Football League. The consistent upgrades on the field as well as in the weight room were clearly evident in the 2009 NFL Draft, with a school-record five former players being selected. 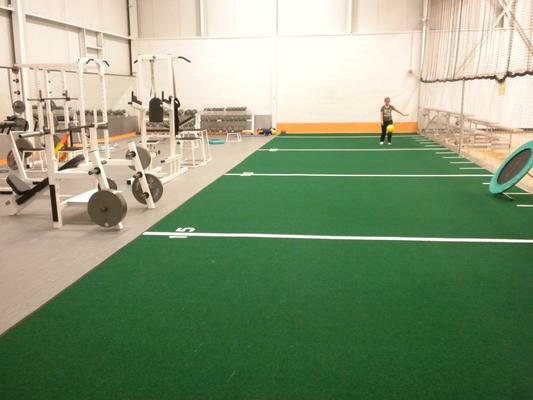 Butler, who earned a Mechanical Engineering degree from Bucknell University in 1991, designed the state-of-the-art, 15,500 square foot strength and conditioning facility in the expanded Hale Center. He incorporated the latest technologies, including digital video analysis, a 60-yard FieldTurf track and other amenities for developing the complete football player. He has helped mold numerous players into professional athletes, several of which are currently enjoying successful careers in the National Football League, including former standout Gary Brackett of the Super Bowl XLI Champion Indianapolis Colts. The latest crop of players to benefit from Butler’s highly-regarded strength and conditioning program includes Brian Leonard, Cameron Stephenson and Clark Harris, who were each selected in the 2007 NFL Draft. Butler was a three-year starter and two-time All-American offensive tackle at Bucknell University, before playing two seasons on the professional level. Jeff Connors enters his second spring as East Carolina's Head Strength and Conditioning Coach. This is actually his second stint at ECU. Prior to rejoining the Pirates, he was at North Carolina for 10 years where he served as Head Strength Coach and as an assistant athletic director. While his primary focus was the football team's strength and conditioning, Connors oversaw the department's entire strength and conditioning program and also worked specifically with the women's basketball team. Connors has been honored as a Master Strength & Conditioning Coach by the Collegiate Strength & Conditioning Coaches association (CSCCa). The Master Strength & Conditioning Coach certification is the highest honor that can be achieved as a strength and conditioning coach, representing professionalism, knowledge, experience, expertise and longevity in the field. Connors' direction, Balmer increased his overall strength and agility and became a first-round NFL draft choice. Before North Carolina, Connors spent 10 seasons as East Carolina's Director of Strength & Conditioning. Under Connors, the Pirates were one of the best fourth-quarter teams in the country. In 1996, the ECU defense did not allow a point in the fourth quarter until the seventh game of the season and in 1999, the Pirates outscored their opponents, 102-56, in the final period. In 2000, ECU had a 94-57 advantage in the fourth quarter. Connors' was the head strength and conditioning coach at Bucknell prior to his experience at East Carolina. Several of Connors' former assistants are now head strength and conditioning coaches at other universities, including: Tom Howley, Director of Strength & Conditioning at Cornell; Jay Butler, Director of Strength & Conditioning at Rutgers; Jennifer Jones, Head Coach of Strength & Conditioning for Women's Sports at Texas A&M; Sonny Sano, Director of Strength & Conditioning at Ohio; Toby Jacobi, Strength & Conditioning Coach at Charleston Southern; Josh Bush, Head Strength Coach, Morgan State; Wes Herlocker, Head Strength & Conditioning Coach, Wofford; Aaron Walker, Head Strength & Conditioning Coach at Elon. Connors was the featured speaker at the 1995 National Strength and Conditioning Association Conference in Phoenix, the 1996 NSCA Conference in Atlanta and the 2003 NSCA Conference. In 1996, he was the Regional Director of the Year and was nominated for National Strength Coach of the Year in 1991. Connors was a competitive powerlifter and has won four state titles in powerlifting and has been ranked as high as fourth nationally. He holds Level I certification in Olympic Weight Lifting by the U.S. Weight Lifting Federation. Copyright 2010 OverAchieve Sports and Speed, LLC. All rights reserved.